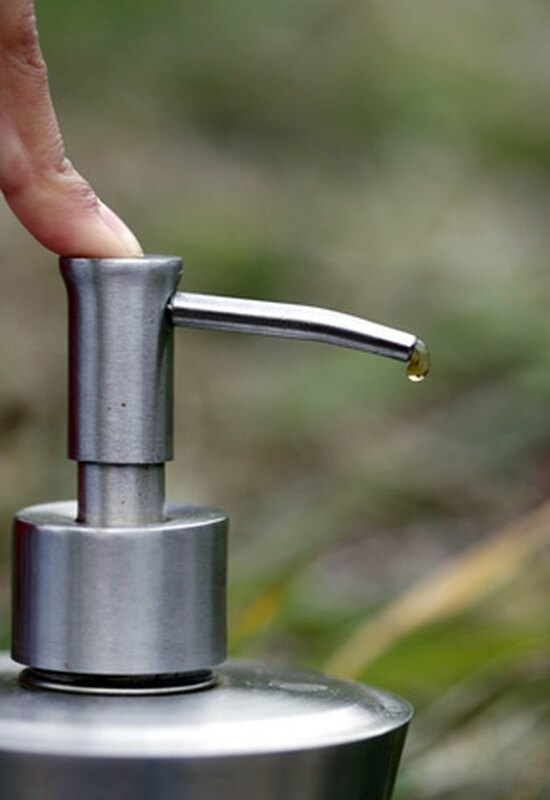 Having a reusable liquid soap dispenser in your kitchen or bathroom is a functional and sometimes beautiful addition to either room. However, over time, coagulated soap builds up inside the pump and renders it useless. Thankfully, there is a quick, virtually cost-free fix for this common household problem. In just a few minutes with a couple of simple household items, you can open up your liquid soap pump and have it working as good as new. Opening a clogged soap dispenser is a simple process. Unscrew the pump from the soap dispenser. Rinse any excess or hardened soap off of the pump by placing it under hot, running tap water. Fill a shallow bowl with very hot tap water and add a few drops of cooking oil. Place the dispenser into the bowl, with the pump itself exposed from the water. Pump it as many times as necessary to expel all blockage, and the water and oil solution runs freely through the pump. Rinse the pump under cool running water. Wipe clean with a cleaning rag and replace on the soap dispenser.